Not making the switch to Windows 10, but love the idea of multiple desktops? Here's how to add that to any PC running Windows XP or higher. For years, both Mac and Linux users have taken advantage of virtual desktops that let you create multiple desktop work spaces on your PC. Finally, Microsoft is getting into the game by adding this feature into Windows 10. But the truth is, Windows has supported this capability for some time—Microsoft just never enabled it by default. So how do you get multiple desktops? All it takes is a small download from a Microsoft site. There are many reasons you might want to use multiple desktops on a single computer. If you don’t have a multi-monitor set-up, for example, you can use multiple desktops to keep organized. You could have one desktop set-up with productivity apps, and a second with entertainment such as a music player. You may even prefer to have your email open on its own desktop to stop yourself from reacting to every message that hits your inbox. First, download Sysinternals Desktops v2.0 directly from Microsoft’s TechNet site. This will download a ZIP file to your PC. Open that ZIP folder, extract the EXE file, and then double-click it to fire up the program. Before you double-click, however, I’d recommend stashing the EXE file in your Documents folder or somewhere similar. Your system will look for that EXE file wherever you store it every time it tries to start up the program. Desktops v2.0 running on Windows 8.1. 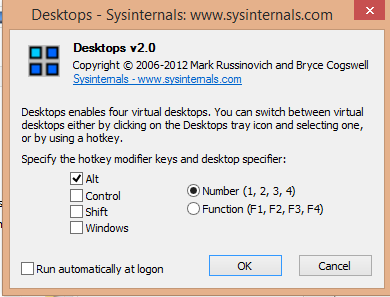 During Desktops’ initial start-up, you will be prompted to decide on the hotkeys you’d like to use for switching between desktops. In that same window I’d also advise clicking the Run automatically at logon box so that Desktops fires up every time you boot your PC. As for the hotkeys, personally I stuck with the defaults of Alt plus numbers 1,2,3,4 for each desktop—the app supports four desktops, the standard on Mac and Linux. (Windows 10 will support unlimited virtual desktops.) You can also switch by clicking on the Desktops icon in your system tray. That’s about all there is to installing Desktops. Keep in mind this is a very basic program. There are no animations to signal that you’ve switched between desktops. You can’t drag-and-drop windows from one desktop to the next. The program also won’t remember what you had open on each desktop once you shut down. You may also find that switching between desktops is a little slow the first time you do it, as it takes a second for each desktop to be created. Once it’s running, however, switching between multiple desktops is very smooth. It’s basic, but Desktops just works on any PC running XP or higher. If you’re looking for something with more features and tweaks, check out Dexpot, a popular third-party multi-desktop solution. It's also free for private use.